I’m so inspired by this lovely room. While the architecture does influence this space, it is the accessories, colors and fabric that give it an amazing personality. You may not have the awesome wood walls or stone floors, but you CAN recreate many of these elements on a reasonable budget. 6. Wide framed mirrors for reflection. 7. Blankets for added Fall warmth. 8. Accessories like a pail of apples and a vase of fall branches. 9. And of course, the red doors. I’m going to paint my doors red. Love the bucket of apples! What a beautiful room. I love the wood walls. I told my hubby if we buy that old house, I want almost every room to be covered in some type of wood treatment. It just adds so much character! Thanks for the beautiful pic! I LOVE Sarah’s House! Everything she does inspires me…especially in this country house. It’s country without being “themey”. The fabrics & colors she chooses make the whole house so cheery & warm! I love the way she mixes patterns & plays with color. Love, love, Sarah’s House!! If I could pick any designer from HGTV to come to my house… I’d pick her – & I’d want to go antique shopping with her! I love everything about that photo. It’s such an inviting space – I think the basket & blankets are my favorites… the bench is next on my list. Character & charm – I remember she mentioned that the flooring needed to be a color that wouldn’t show too much dirt: how smart is that?? Hi Melissa! I have been so enjoying your 31 Days of Autumn Bliss series. Have you seen the November 2010 issue of Canadian House & Home? Mine just came in the mail on Friday and it features this room with Sarah & her family on the cover….but with a Christmas theme. And the inside features this home dressed for Christmas! This is Sarah’s family’s country retreat when it’s not cottage season. No, I must get that!! Thanks so much! I triple-dog-dare you to paint your doors red! I bet it will look great! I saw those doors on Houzz and love them! I’m itching for some colorful doors now. And I want that rug for my kitchen. I wonder if it’s Dash and Albert? The room is featured in the November 2010 issue of Canadian House & Home and it says the rug is from Ikea. yes, I can confirm the rug is from Ikea – I actually own it :) and it even looks better “in person”! Wow ! it’s gorgeous ! I’m going to paint my door red too !! I could sit and look at that picture forever. I have let my house go and need to reclaim it. Have been having so much fun being outdoors, running, biking, swimming —- but my house is so important to me that I must find my way back. Tonight I completely cleaned my dining room. I wanted ONE room that I could look at and take a deep breath. Love that red! Since we got rid of our cable and I have forgotten about Sarah Richardson… Although my husband is probably pretty happy since I would re-watch all the episodes at least once a week and each time I would see something new that I didn’t catch the first or well maybe the fifth time I watched it! Sarah Richardson has a paint line, but it’s only available at Lowes in Canada… So we aren’t far from the border in Washington so I thought roadtrip! Yes for paint, pathetic I know.. But sadly I discovered her paint is only available in eastern Canada… So my doors will have to wait to be painted because Sarah’s colors are just so amazing that nothing will subsitute! I’m another who wants a rug just like that for my kitchen. I was eyeing off one in a mag a few days ago, but this one is better as it has no blue in it. That room is absolutely delightful…. I want to transport myself there and stay all day. I’m well known as a ‘red’ girl, and for loving autumn colours, so a room like that is pure bliss for me. I’ve promised myself I’m going to paint the exterior of my front door red one day. I’ve always wanted a red front door, and it’s definitely going to happen! And, the paisely….. say no more. hmm…that link below my comment is NOT my blog…not sure how that got there. That is a fantastic hall. I love the mushroom pain (and of course the fab combo of curtains & rug). At the moment, my favourite colour scheme is very un-Sarah-ish – navy with mustard, shocking pink and white!! Just blogged about it yesterday and today – quite a style departure for me! We have done so many huge projects on our house, gutting and starting over in every single room because sadly it needed to be done. BUT the best thing about each space is the color of the walls. Not the finishings, trim work, etc… just the paint. I love color and how it can either make or break a space. And I am always so happy to walk in my cheery red front door with my bright and colorful house numbers on it. 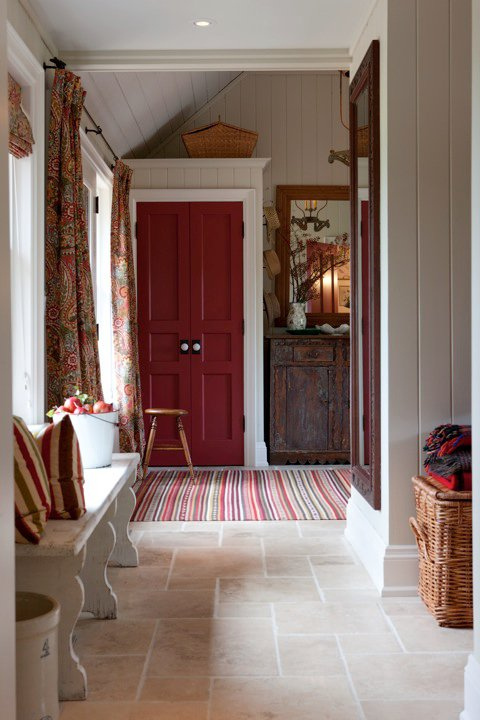 I love this room, particularly the red doors, the striped rug and the bench. I want a bench. I LOVE Sarah’s House on HGTV. I mean, every room is just perfection! The entry/mud room was my favorite! Those doors! The drapes! The antique piece! Ooohhhhhh!!!!!! I also adored her kitchen, so lovely! I too love Sarah’s style. The “old” cabinet between the closets is fabulous as well as the paisley curtains. The entryway is truly warm and inviting. I think the rug from Ikea might be the Kattrup rug. I would love to see the farmhouse decorated for the holidays that are featured in the magazine. Love this room! As far as I know this woamn is not shown on UK tv, but whenever you show anything of hers on the blog I just sigh with contentment. That room is so inviting! This room inspires me as well! Thank you for sharing it! This mudroom inspires me. Mine is similar but most certainly without the piazza. I love red and am so glad it is back with traditional country look…for my very own farmhouse. Soon and very soon, I will be painting. Looking for that between the closets furniture piece first. Yes, I have 2 closets with a opening between them! How cool is that! Love, love, love Sarah’s House and love your blog!!! LOVE Sarah. I want to channel her so I can give every room the Sarah treatment. This is great! I am ready to go get some apples and branches now! Love it! Inspiring me today is the use of pink accents in your home as a reminder of National Breast Cancer Awareness Month and the brave women who have faced the disease. It can be as simple as a vase of pink flowers or a pink flirty pillow. Pink for fall!! I’ve always wanted a red door…maybe someday. I think this room is so inviting. I heart those paisley curtains & the bench.. awesome!! Unfortunately I live too far out in the country and don’t get cable TV, but I keep hearing about Sarah’s House. I’m going to have to go spend some time at my Mother’s and see if I can catch it! LOVE this room. Amazingly enough I just redid my entry and used T-111 on the walls and painted it almost that exact color. I’m using it in my den as well. Just this weekend I painted my new front door a beautiful red and I LOVE it. I’ve got double closet doors in the new entry waiting to be painted. I was going to paint them white to match the crown molding, but after seeing this I may just do them red. Thank you so much for this inspiring post. Now I’m REALLY excited about finishing my entry way! This IS a great room! I love how all of the elements add up to a cozy, welcoming space. I smiled at your comment about painting your doors red, because we had red front and back entry doors for several years, and we just painted them a soft blue this summer for a change I needed. Our house is painted a dark beige and so any door color goes with it. My husband just smiles and goes along with my whims! I’m lovin’ your 31 days of autumn bliss! You have a wonderful gift of seeing everything in photos. I need to follow your example and pay closer attention. This is a lovely space. Gosh- I feel so avant gard! I already have one of my doors painted a shade of barn red! It is the inside of the door leading out from my fam room to the lanai. It’s a welcome punch of color and I love it! I wouldn’t think of ever having this door safe white again! Love Sara’s house and her talent/bugs me that she always talks about trying to stay on budget but always goes for the item that is a splurge. I would be more impressed if she could do it on a budget like we all have! The paisley curtains, bench, basket of apples and red doors just say “Autumn”. ok, red doors, you even wrote it in BIG LETTERS! We will be on the edge of our seats for that one! Love the idea! Now you have be thinking PAINTED DOORS! My list of things to paint just grows daily! My favorite Sarah room….by a mile! I think it was you who got me started watching that show in the first place! Thanks! Yep, it was you, back on June 7th! I just checked. Where did those awesome paisley curtains come from? I must have them! That photo made me happy this Monday morning! I was very inspired. Last night I began two coats of red paint on my entry closet door. I plan two more coats today. I brought down a little bench from my vanity and added a striped pillow. My entry is very tiny, but I was able to take the elements you listed in the photo and adapt to my space. I am just smiling at that red door! PS -I used old (really old 2006) paint that was from my stair case treads. I love everything about this picture. Especially the door. Love this! I was wondering…since I’m a fairly new fan of yours, I might have missed this so please forgive me. Do you ever allow your readers to submit photos of their own rooms for your advice and inspiration?? I have a long rectangle of a family/living room in my tiny house and I need some help from someone creative to help me freshen it up on a budget. Maybe your readers could also chime in. We don’t have another TV room and we have a young son, so it must be kid-friendly. But I need advice! :-) Cheers! I’m seriously considering picking myself up some of this fabric & mistreating my front entry window & the one at the top of the stairs that is in view from the entryway as well.